The first Chinese, like many other immigrants to Plumas County, arrived about 1850 as a result of "Crazy" Stoddard’s Gold Lake myth. Diligently working the stream-bed gravels spurned by the white miners, immigrants eked a living, mostly using cradles, pans, and sluices. By 1880, their numbers had increased to make them the highest percentage of gold miners in the county. 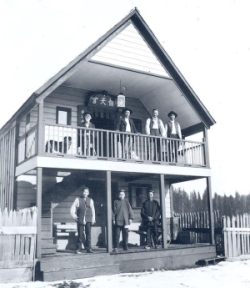 View a collection of archival photographs of the Chinese in Plumas County. Although sometimes abused both physically and verbally, there were no lynchings or major purges of the Chinese here, unlike some neighboring counties. Because they were not interested in assimilating into American culture, the Chinese developed their own communities near the white settlements including Silver Creek, the area's largest Chinese settlement. Because of immigration laws, there were very few Chinese women here. Most of the Chinese miners were young males, in their early 20s, and when gold opportunities diminished or ran dry, they left. Through about 1910, there were a number of companies of Chinese miners still working various sites in the county, mostly in the southern portion. Interestingly, there is no evidence to show that the Chinese participated in the construction of the Western Pacific Railroad through Plumas County at the turn-of-the-century. In time, most left to work in the urban areas. The old men who stayed here eventually died and were buried near their communities. Several books on the Chinese are available at the Plumas County Museum. If you have any questions or would like to order a book, please call (530) 283-6320. We accept checks, Visa, MasterCard, or American Express.